The document below shows how pro-environmental measures can translate into budgetary savings for productions. 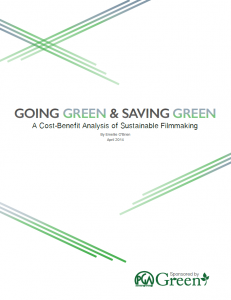 With adequate preparation during pre-production, thorough communication across all departments, and an Eco Manager/Eco Supervisor to oversee initiatives and track progress, sustainable film making is not only effective, but cost efficient. The bulk of this analysis surrounds New York specific vendors and pricing.